Shock Effect whitetail products is a family owned company with over 22 years of combined experience in nutrition testing with live whitetail. All of our products have been designed from using this experience combined with one of the world’s best Micro Biology Laboratories. The only true way to test any supplement is to have live whitetail at your disposal in a controlled environment. We have three test locations which give us a good variety of elements to test in. We also have tested with the top deer breeders and whitetail veterinarians in the world for the last several years. Shock Effect is the future in whitetail nutrition and is the top antler supplement being used in the whitetail breeding world. When we started testing with deer breeders I was shocked to see that 99.9% of the so called antler products at your local sporting goods stores where not being used by these breeders. Many of these products come with a money back guarantee. The problem is you can’t prove their product didn’t help, it’s all a sales gimmick. If any of those products really worked the breeders would be using them. 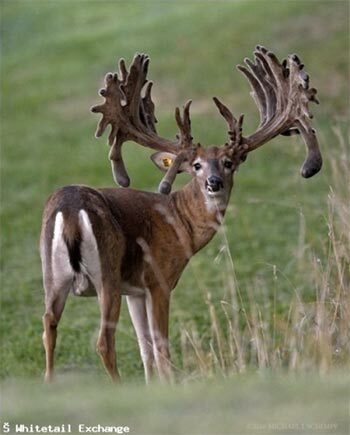 Our Antler Maximizer product is the no.1 antler product currently being used in the whitetail breeding world. Over the last several years Shock Effect has been consistently producing around 75% of the worlds largest bucks that score over 500″. Every year the records keep getting broke and it’s been a dream come true to be part of it. Here is a picture of one of the awesome 500+” bucks that was on Shock Effect. Whitetail deer have been our life passion and obsession. Our motto is “THE BOTTOM LINE IS RESULTS” and that’s all that matters!